I've been working on reviewing apps all the live long day... I've been working on reviewing apps just to pass the time away. Can you help me by reading this and passing it along too? Can't you hear me shouting come and read my review? Okay, I had to try re-write the lyrics to "I've Been Working on the Railroad" but I think that the Bats in the Cave version is actually a much better re-write. 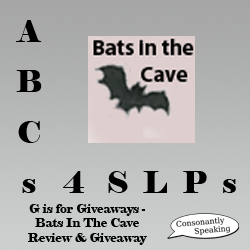 Anyhow, if you are looking for a spelling application that works on silent e and more, Bats in the Cave offers practice with this skill through a fun mining activity! Continue reading for my review and a giveaway of this application! "I've been working in the coal mine all the live-long day... I've been working in the coal mine just to keep the bats away. Can you help me spell my words? Help me read them too? 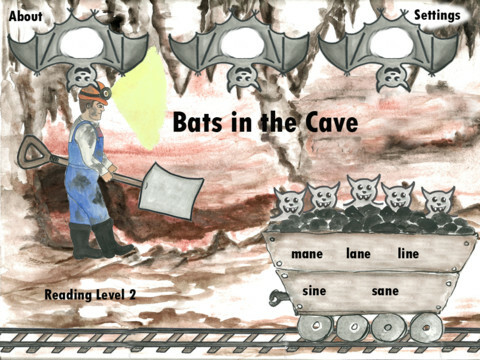 And the bats will stay away 'til the job is thru..."
This app states that it is for Reading Level 2. There are two other options on the Main Page: About and Settings. At the top of the page, it gives the password to be able to save data and collect scores. You can have up to eight users. 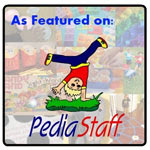 The About section also discusses the population to use this application with, website, activities/research online, credits, support, and an iTunes link for reviews. To access the settings, enter the passcode: pippi. Then, you can add an e-mail address to e-mail results to, add up to eight client names, view scores, change the starting group, delete clients, and choose who will be playing the app. Press on the coal miner and a bat will appear with a sign. Press the letters in the correct order before the time runs out and the letters will appear on the sign. Then, if correct, the coal miner will animate to place the word on the cart and the word will be sounded out and stated. If the user runs out of time, the bat will fly downward and screech. You can press the "Go Slower" button for the bat to move slower and the "Go Faster" button for the bat to move faster. Once five words have been placed on the cart, the app will ask the student to choose the word stated aloud from the five words. Each time a word is chosen correctly, a bat will appear in the cart. Then, once all five have been completed, an animation will play and more words will show. This application focuses on use of the silent e by placing the e in parenthesis and having the student sound out the beginning of the word to add it at the end with the appropriate vowel sound in the middle. Words are practiced by sounding them out in parts, blending them into a word, and identifying/reading the words. The application is animated which motivates students to continue playing. Since the password is shown on the application, it does not protect confidential data as well as it could. It would be great if the teacher could choose the password. Sometimes when a word is sounded out, the associated word does not show up in a cart, a different one appears (such as a previous word), which can be confusing. It is probably a glitch that just needs to be adjusted. RtI/Phonological Awareness - Sounding out and blending words together is essential for literacy and speaking. This application also works on vowels and the silent e.
Expressive Language - Place the words from the application into sentences spoken and written. Bats in the Cave is available for the iPad for $4.99. There is also a Lite version available to try for free. 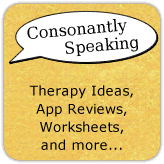 Consonantly Speaking was given a copy of this application to give away with this review. No other form of compensation was given.